By Ali Cinar- Washington,DC - U.S. Secretary of State Rex W. Tillerson has invited 68 Minister of Foreign Affairs & Senior Leaders for a Special Meeting that was held in Washington, DC on March 22nd. 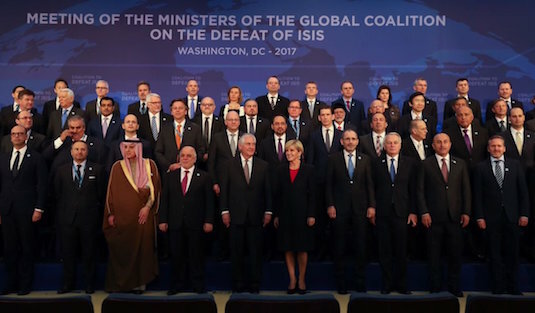 The objective of the Meeting was to accelerate global efforts to defeat ISIS in the remaining areas it holds in Iraq and Syria The meeting also highlighted specific ways the Coalition can effectively collaborate to defeat ISIS internationally. Turkish Foreign Minister Mevlut Cavusoglu has also attended the meeting since Turkey plays a critical role fighting against ISIS in the region.Turkey has started the Euphrates Shield in Syria in order to fight against ISIS since August 2016. Minister Çavuşoğlu stated that U.S. and Turkey are "vitally important" for one another. When we work together effectively we bring about positive change . 68 Coalition Members should defeatISIS without any excuse.Turkey is ready to support more on this fight. Cavusoglu also raised a question on US support to PYD-YPG" We cannot rely on another terrorist organization in our fight against Daesh . The YPG-backed Syrian Democratic Forces has been Washington's principle partner in the anti-Daesh fight in northern Syria .We should know that YPG is a terorist organization linked to PKK"
Terrorist Organizations PKK​ and ​PYD ha​ve​ been accused by human rights groups of committing significant human rights violations in ​in Syria, including "ethnic cleansing" massacres against local Arabs and Turkmens. Secretary of State Tillerson mentioned the "interim zones of stability" in Iraq and Syria that is to allow refugees to return home safely once ISIS fighters are no longer for a ​ threat. Turkey is also supporting the Safe Zone​ approach​ in a different way. Turkey and some allies called for the zone — using American air power to protect Syrian civilians.